I want to kick off this article with some impressive numbers from the MTG Stocks Interests page. Next, I’d like to break that group of 21 cards a different way, attempting to categorize them by format. I’ll admit I’m making assumptions here but for the sake of discussion, this should be accurate enough. These numbers alone could be the basis for a multitude of articles. 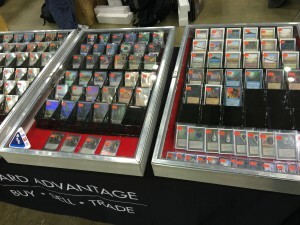 One could discuss the sheer number of movers and shakers on the MTG market. Someone else could write about the top Modern movers and highlight what they think is coming next (essentially what I tackled last week). Others still could focus on Commander, sharing their thoughts on the recent surge in prices of certain cards and relating this to the newest set of Commander decks that have now saturated the market. And don’t worry, I don’t plan on dwelling on about Old School MTG except for one thought worth your attention: when I uncheck Alpha, Beta and Unlimited from set exclusions on MTG Stocks, I see an additional four Old School cards that have increased in value over 50% last week. The format’s impact is real even if you don’t believe the format itself is worth considering. So What Is the Topic? So much has been going on in MTG finance lately, and I have found myself chasing numerous buyouts and speculation opportunities. Someone will observe a card with low stock on TCG Player, make a comment, and suddenly the card will blow up in price. This is essentially what happened to Spellskite, and the rapid rise in top buy list price suggests this surge is here to stay for at least the short term, though a small pullback is likely. The same goes for Inquisition of Kozilek ($12 buy price at Channel Fireball) and a number of other Modern staples. As I scramble to keep up with this volatile market, two things linger in the back of my mind. It’s these two murmuring thoughts, which I believe many will overlook, that make up the subject of this week’s article. Regarding your quick hit about the Mox Opal- with Spellskite and Inquisition both surpassing their previous all-time highs, is this a trend other Modern staples could replicate? 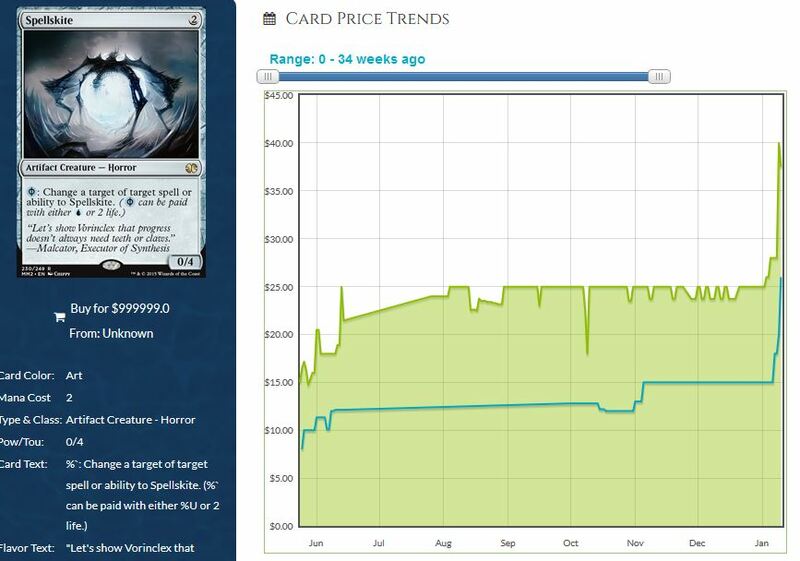 This Modern season, could Mox Opal exceed the high of ~$60 it achieved during Modern season back in 2014? Good question. Mox Opal in particular shouldn’t hit all time highs in 2016 because there’s much more supply of the card post-Modern Masters 2015. But if the card dodges another reprint, I could see highs getting hit in 2017. But just because this doesn’t hit $60 this year doesn’t mean it’s a poor investment. 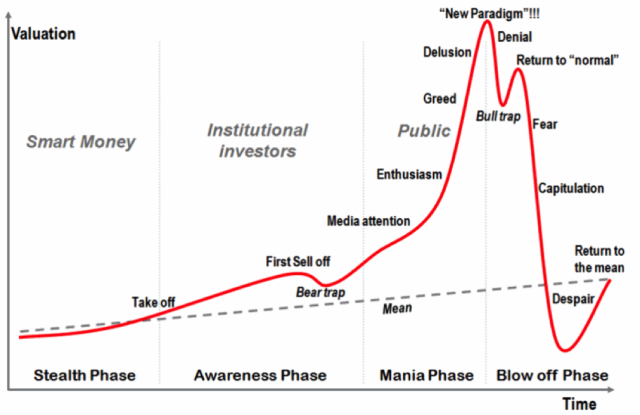 Honestly I think we’ve put in the bottom on many staples from MM2015 and I like most of them going forward – just be aware the most upside probably comes next year. Inquisition didn’t get reprinted last year so that’s why that card is hitting all time highs. For Spellskite, the card is truly EVERYWHERE – over 50% of Modern decks have a least 1 copy. If this remains the case, Spellskite should be jumping before some other MM2015 cards as this makes sense. So revisiting this question, post-Twin ban, does Affinity take a much higher stake in the meta? Pushing Opal up past $60 this year?